Imagine a world without shattered smartphone screens: No more need to spend hundreds of dollars replacing cracked screens, no more need to spend money on countless accessories to baby your phone – and no more of those inane drop-test videos. Thanks to researchers at The University of Akron in Ohio, that world may soon be a reality. Polymer scientists at the university have developed a transparent film of electrodes on a polymer surface that’s proven to be extremely tough and flexible. In other words, they’ve developed what could be a more rugged, bendable and cost-effective alternative to today’s delicate smartphone screens. 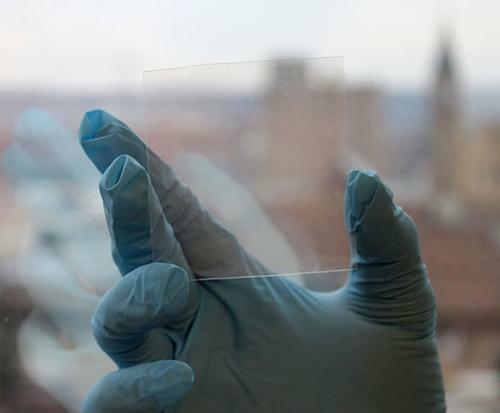 Today, most smartphone screens are coated with indium tin oxide (ITO), a transparent electrical conductor that’s brittle and increasingly expensive to manufacture, according to the researchers at The University of Akron. This new film offers better electrical conductivity while maintaining the same degree of transparency as ITO, according to Yu Zhu, an assistant professor of polymer science at the university. It’s also sturdy and durable, as it retained its shape and functionality after being bent 1,000 times in testing and withstood Scotch tape peeling tests. Thanks to its flexibility, the film can be produced in low-cost rolls. “We expect this film to emerge on the market as a true ITO competitor,” according to Zhu. While Corning and GT Advanced Technologies are dueling each other to produce the toughest screen for smartphones, Gorilla Glass and sapphire both have lower-than-desired thresholds for durability when it comes to drops. While we wait for a truly shatterproof smartphone screen to make its way into the real world, there are plenty of cases and screen protectors to help protect your precious mobile device.